River City Brass in Emlenton – June 20, 2014 - Go Foxburg! It don’t mean a thing if it ain’t got that swing! With that catchy phrase, Allegheny RiverStone Center for the Arts (ARCA) presented the internationally acclaimed River City Brass – America’s favorite Brass Band – at its first concert in Emlenton at the Crawford Center on Friday, June 20 at 8:00 PM. Conductor James Gourlay, acknowledged as one of the world’s greatest brass band conductors, will be conducting the 28-piece ensemble in a program of “Big Band Brass”, charmed the audience with his delightful banter. The program featured hits made famous by the ‘Rat Pack’ – Frank Sinatra, Dean Martin and Sammy Davis Jr. – as well as the big band sounds of Glen Miller, Duke Ellington, Maynard Ferguson, Buddy Rich and many more. Early bird ticket buyers took advantage of discounted prices from May 1 to May 31 – Adults $15 and Students $5 – by calling the Foxburg Inn at 724-659-3116. Regular pricing was offered from June 1 through June 20 – Adults $18 and Students $8 – by calling the Foxburg Inn at 724-659-3116. Tickets were be available at the door. ARCA is grateful to The Farmers Bank, Hovis Truck Service, Hickman Lumber Co and Allegheny Hardwood Flooring and The Foxburg Team for their sponsorship support, bringing River City Brass to Emlenton for this debut concert at family-affordable popular prices and an early bird discount will be offered for this first-of-a-kind Crawford Center event. ABOUT RIVER CITY BRASS BAND: Founded in 1981 by the late Robert Bernat, (conductor and music director 1981‐1994) the RCBB was the first professional concert band to be established in the United States in over 25 years. 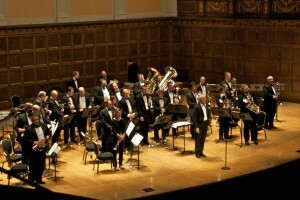 Today, the River City Brass Band performs a 56‐concert series in Western Pennsylvania. In addition, the 28‐piece ensemble tours extensively throughout the United States with more than 60 performances each year as part of community concert series, major symphony pops series, and arts festivals. For thirty years the RCB has delighted audiences in the Pittsburgh region, nationally and internationally. Their most recent international tour took them to Italy in May of 2013. From California to New York (as well as everywhere in between), River City Brass Band has delighted audiences with its signature style. Every performance features both superb soloists and some lighthearted fun! Often called the “Boston Pops ‐‐ In Brass,” the band’s extensive repertoire includes American tunes, Big Band swing and jazz, music from Broadway and Hollywood, classical and contemporary masterworks, and ‐‐ of course ‐‐ traditional marches.